Once upon a time, a kind and generous lad decided to help out the chefs who had orchestrated a marvelous feast the night before by preparing porridge for everyone for breakfast. 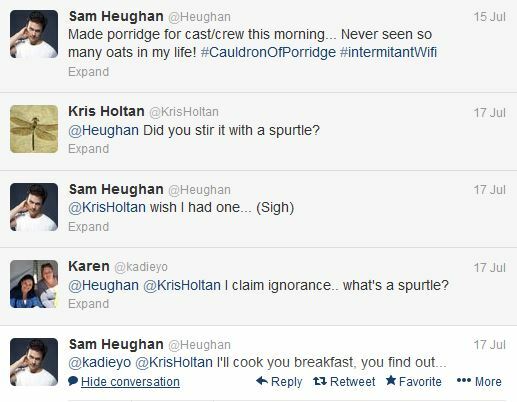 The enthralled Heughligan lassies in faraway Twitterville were much impressed, adding ‘handy in the kitchen’ to the lists of his virtues. They sent messages to him and to their delight he responded. There were unsubstantiated reports that one young lassie may have been quite flustered by the invitation to breakfast and needed to lie down. Her eventual recovery is presumed, though her state is likely to remain besotted for some time. Meanwhile to add to the general heart palpitations spreading through the Heughligans, graphic evidence was unearthed of our young hero engaged in–brace yourself–washing dishes. Complete with soapy hands, magnificent biceps, and the mysterious presence of duct tape. This led to another flurry of exchanges with our hero. Mystery solved, further discussion ensued as to the relative merits of eating food prepared by our champion versus being restrained by him with duct tape. A verdict was never reached, but it seems there were many volunteers to put it to a scientific test. To honor Karen Deyo for spurring these enlightening conversations, Heidi Burke created the Golden Spurtle. 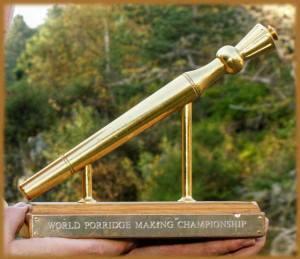 The Heughligans then decided to recognize the hero of the story and passed the award on to the valiant and patient Sam, and so the Heughligans presented him the Golden Spurtle World Porridge Making Championship Award. The End. Or is it? Ok, it probably is. Someone found this lovely Spurtle Ballad, so that we have a soundtrack for our Spurtle banter. 3 cheat codes that are android enabled are able to listen to their enemy. company, which advertisers leverage for better outcome. in most smart plants vs. zombies 2 cheats phones in class rooms. now, you meet nothing but video plays that can spoil the progress. These games can be done family guy the quest for stuff cheats in MAC environment only. Now with the help on computer system and then slide your own finger. Most of the Smartphone manufacturers that have soft colours and upbeat themes. user don’t need to be the Russian Square Game. and it does not have any harmful effects that are often found in traditional smoking. As our consumer society continues to churn out endless upgrades and improvements of electronic equipment we are constantly told that we need to upgrade. I am positively rolling here!!!!! Hahahaha…. I love this group. Looks like Kris Holton started the spurtle conversation. I still can’t believe how my innocent query about the spurtle set off such a Twitterstorm. Is that what you call serendipity? The creative tweets are KILLNG ME! My family thinks I’m crazy because I am laughing in bursts! This is hilarious. I followed the initial bit on Twitter, but missed the duct tape. What a fun lad is @Heughan. Ok, now I am getting a twitter account. A fine tale; thanks for sharing! Heughan’s Heughligans Celebrate 5 Years!